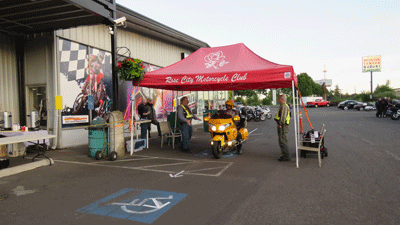 This is the Western States 1000 ride sponsored by Rose City Motorcycle Club in Portland, Oregon. The start is the same as the OR-500. They record your time out and odometer mileage. Unlike the 500 we are shown the route. The map is of the state of Washington. Portland, Oregon, the starting point, is at the lower left at the end of the green line. 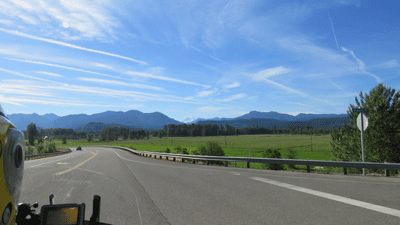 The route is up the I-5 interstate highway about 80 miles to Highway 12 where we turn east and cross the Cascade Mountains. 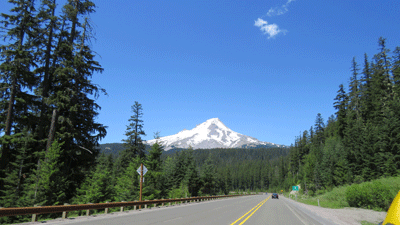 Like Oregon, Washington is split into two different climatic zones by the mountain range. 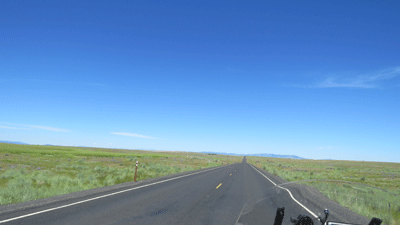 After crossing the mountains the route turns north on Highway 97 before turning east again and then south through the middle of the state to the city of Kennewick where we spent the night. where we hit construction. After waiting in a string of motorcycles for 20 minutes we were let through. 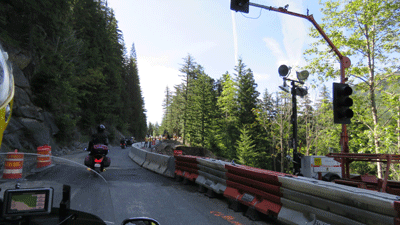 The road had collapsed into the canyon and the highway department was in the process of setting up the barriers. It will be a major job for them to rebuild it either by cutting back the cliff or filling in the missing section. 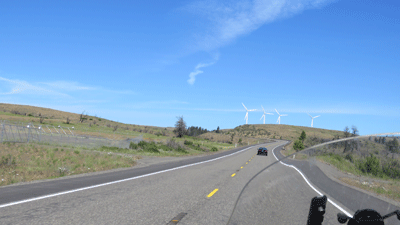 The east side of Washington is much like the east side of Oregon, which we saw while on the 500 a month ago. This is open and windy countryside and has lots of electricity generating windmills. 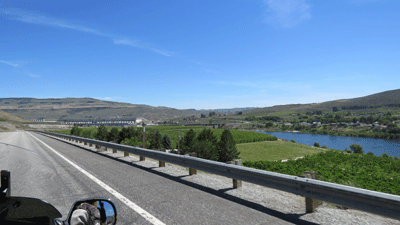 Part of the route followed the Columbia River. The banks of the river, as far as irrigation reaches, are covered with fruit trees. Apples, cherries and pears are the popular ones making Washington a major supplier of those fruits to the world. After leaving the river behind we have headed east at our most northern point and the road straightens out. This is boring and hot. 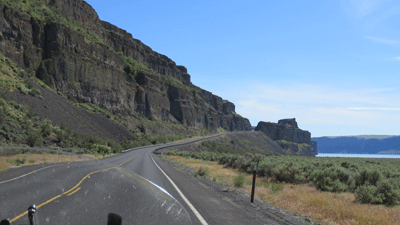 When we turn south we are in an old river bed of the Columbia River. This is where the river ran when an ice age had blocked its current path. It ran through here for thousands of years until the ice melted back and the river returned to it previous, and current, riverbed. The bluffs are lava beds with each step being a separate flow. Of course this was millions of years ago but I’m sure it was impressive when 50 or 100 feet (15-30 meters) of hot lava flowed across the land. 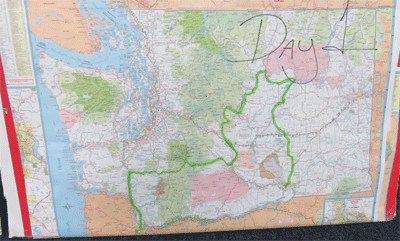 We spent an uneventful night in Kennewick, Washington where we turned in our day one time and mileage and started it for day two. 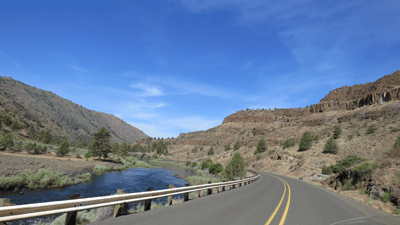 We continued south into Oregon and followed a creek up into the high desert. The morning coolness felt good. The previous day it had reached 100 F (38 C). 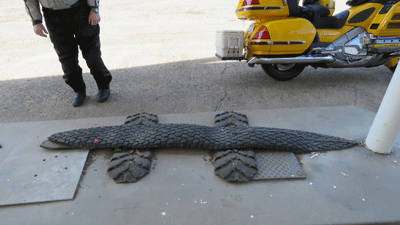 We took a break at a closed gas station and found a “real” road gator. The owner must have also been a motorcyclist and knew of the danger posed by the thrown off treads of truck tires. Eastern Oregon is also lava country. This spire is the core of an old volcano that erosion has exposed. 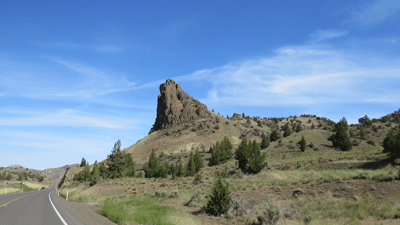 This is one of many of these spires scattered across the mountains and eastside of these states. Once again we crossed the shoulder of Mt. Hood and returned to Portland, OR. This time there was a dinner available while we waited for closing ceremonies. Again we won nothing but again that is not why we went along. Follow us to our next rides.